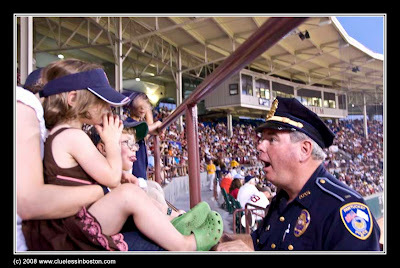 I was at a ballgame in Pawtucket Thursday night and caught a policeman feigning surprise at two young mischievous, albeit very cute, children sticking their tongues out at him. Whoever said policemen don't have a good sense of humor have never been to Pawtucket, Rhode Island. I can just hear them giggle. I like to see the interaction between those in government and those contributing to their paycheck. That' funny, Abe! Yep, you got a good shot of these 3. I think a sense of humour would have to be a necessity if you were a policeman!!! Great shot. Thanks for your kind message on my blog. The accident was horrific with a family devastated - their Mum killed, and her 2 teenage boys critically injured. The only saving grace - the youngest child got out with only scratches. Life is short so we must make the most of it everyday!!! Yhis reminds me of an old b&w image of a cop beding down to a little girl. It was cute, full of humour, a one off shot. That pic by the way won A Pulitzer. I would lve to see this in b&w. t's a very human image, wonderful. Very nice catch...we have to glue it in every police station ! !